Mayasir, have released their limited exclusive range of designs for this season's collection. With a wide category of designs and accessories to choose from, customers will find it easy to choose something to their liking. Along with the Men's and Women's wear and sandals, a variety of other accessories are also for sale including bags, scarves, dupattas, shawls and jewellery. 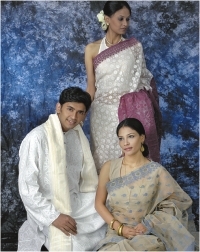 Men's wear mostly consists of Kurtas, Fotuas and Shirts while the Women's wear provides sarees, suits, kurtis and dresses as well as lahengas. Be sure to check out the silk and leather bags and others embroidered with sheesha work and ethnic batwas. Also pay a visit to the sandals section as there too you will have a wide category of items to choose from. Finally the jewellery section sells pure silver items and semi precious stones like amber and turquoise. All in all Mayasir with its bold colours of reds, vibrant pinks, sunshine gold coupled with the tranquil ones of turquoise and aqua have put out a wonderful collection for this season. Its a must visit in your shopping escapades! Aranya's Eid collection is highlighted by its exquisitely designed kantha stitch saris with matching kantha stitch shawls in subtle natural dye shades as well as classic colours of black and wine red. A special range of kantha stitch kameez-dupatta-shalwar sets have also been created in fresh colours. Superb cotton Jamdani saris, in original designs of the past, complete the traditional range. Natural dye printed garments saris, sets & punjabis are in abstract and linear patterns inspired by the Bahaus technique. As always no two saris of Aranya are identical in design or colour. Also, for the first time pure cotton Jamdani punjabis have been introduced to complement the fine chikan and applique range. New layouts and patterns have also been made in women's wear in chikan embroidery. Blue and green have been emphasised once again to promote natural indigo which has been revived in Bangladesh after more than a hundred years. If you are fond of outfits in the black and white combination, visit Shada Kalo at Rifles Square, Baily Road and Banani Road no 11. They are offering couples' outfits with similar decorations and combinations. Try their Sari-panjabi or kamiz-fatua set. It might make you the couple in the spotlight this festive season. Renowned fashion house Banglar Mela is bringing out silk and endy saris, sherwanis, fatuas, three pieces and tops. This season's attractions at Banglar Mela are men's fatuas with Afzal Hossain's drawings of colourful masks on them. While you are there, look for their silk saris with kaantha stitch, appliqué and shed-work. Orange, ash and black, are the chosen colours for this sari collection. Banglar Mela is situated at Banani-11, Mirpur (opposite the stadium) and at Mirpur road, Sukrabad. To have an exclusive shopping spree for men's items only, visit Handy Bazar and Khaki. Their colour for this festival is off- white, maroon, black, and brown. Adroit, the fashion house that was recently awarded the Neelanjana Palli best boutique award in 2005 has come up with some magnificient designs for all strata of people. Children wear to men's to ladies, you name it they have it for you this Eid in their showroom at a very reasonable price.